A gorgeous natural color image of A68 captured on September 11, 2017. (Image: Jesse Allen, using data from the Land Atmosphere Near real-time Capability for EOS (LANCE)). Two months ago, an iceberg half the size of Jamaica tore itself loose from Antarctica’s Larsen C Ice Shelf. As it slowly drifts north, this massive berg is exposing an area that’s been covered in ice for the past 120,000 years. An international agreement has now been put in place to protect this emerging area and keep it in pristine condition. 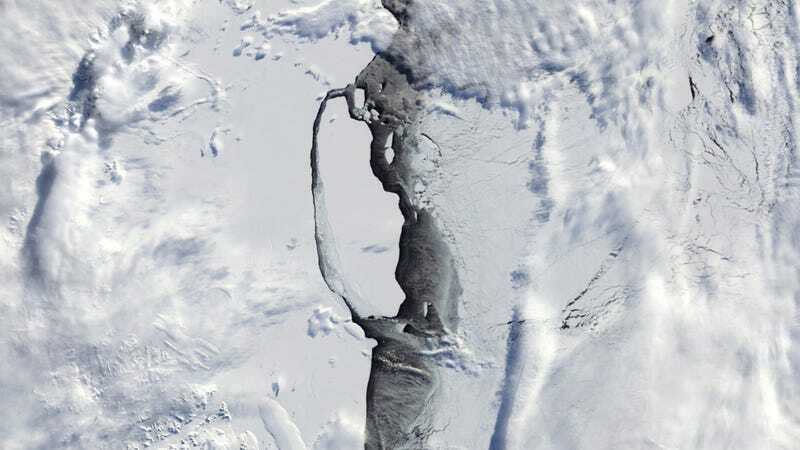 The 2,240 square mile (5,800 square km) iceberg, dubbed A68, broke away from the Larsen C Ice Shelf on July 12, and as it drifts away and disintigrates, it’s leaving a similar-sized area of previously obscured seabed in its wake. The research community is eager to turn this unusual episode into a major scientific experiment, but the threat posed by opportunistic fisheries could derail such efforts. Thankfully, a recently established international agreement by the Commission for the Conservation of Antarctic Marine Living Resources (CCAMLR) provisioned for such an event. Under the new guidelines—which were agreed upon last year—a special area can be designated for scientific study following the retreat or collapse of ice shelves across the Antarctic Peninsula. The agreement was proposed by British Antarctic Survey scientists Susie Grant and Phil Trathan. The area exposed by the Larsen C iceberg meets the criteria as set out by the CCAMLR, and it’ll now be a protected area for the next two years. The commission will likely extend these protections by another ten years following a subsequent review. Scientists can now work in peace in this area, free from the impacts of commercial fishing. They’ll be able to address questions about how new biological communities emerge, colonize, and develop in areas previously covered in ice. This part of the ocean hasn’t seen the light of day since the last inter-glacial period around 120,000 years ago, so it’ll be fascinating to see how long it takes the seabed to bounce back with new life and new ecosystems. “The Larsen C iceberg calving has generated a unique and exciting scientific opportunity, and the importance of this area has been further recognized through CCAMLR’s agreement to designate it as a Special Area for Scientific Study,” said BAS marine biogeographer Susie Grant in a statement. The collapse of ice shelves is a natural, cyclical process, whereby they grow, decay, and break free. The recent calving event can’t be definitively tied to global warming, but there’s ongoing debate about that possibility. Regardless, further investigations could help scientists understand the effects of climate change in this region and elsewhere, both on the landscape and the surrounding ecosystems.